America is in need of a woman President. We need this book to make it happen. You are aware that in the wake of President Donald J. Trump's election to the White House, the world saw an increase in hatred and violence. And an immediate response from women everywhere in America. We gathered in record-breaking numbers across the globe to march in protest of our new leader's misogynistic behavior and harmful political agenda. Inspired, perhaps, by the sea change instigated by these marches, as well as recent women's rights movements like #MeToo, #TimesUp and #ShePersisited, a flood of women are now running or are poised to run for elected office. And in November we elected 40 new women to The House of Representatives. This harks back to 1992: The Year of the Woman. When televised hearings of the confirmation of US Supreme Court justice nominee Clarence Thomas aired allegations of sexual harassment against Anita Thomas. He won his bid. But we did not stop. Then again this year with Justice Brett Kavanaugh. He also won his bid too. But we are not going to stop are we. NO! We are going to keep going until we vanquish all harassment and break the biggest and highest glass ceiling yet. Author Rebecca Sive knows that qualified candidates are not enough to just win. 229 years of exclusion from and underrepresentation in the US Federal Government. We must find a way to mobilize every woman, no matter what her prior political involvement, thoughts on the word feminism or political affiliation and give her specific everyday actions that will help elect Madam President. 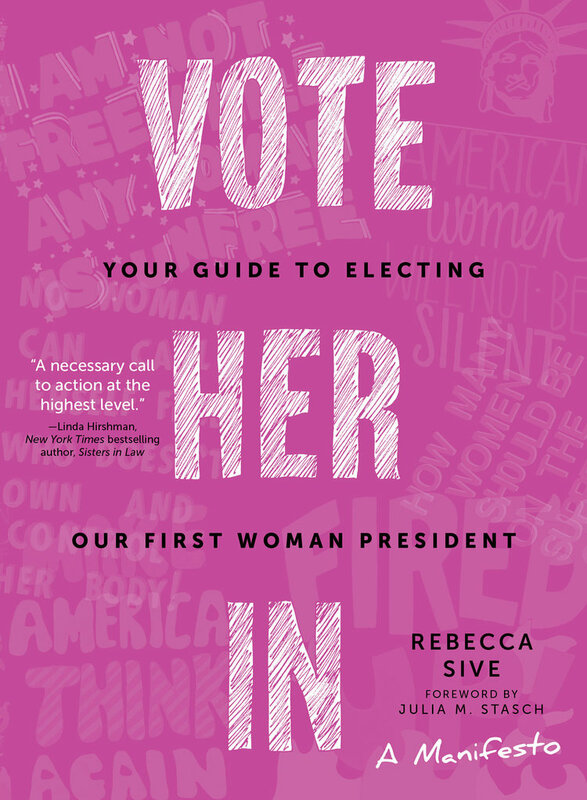 Ms. Sive has a manifesto about why we should elect a woman President in the first place. And as soon as possible. This should be understood inside and out so that we need to educate other women and get them to the polls. Research has shown that women in legislative governmental positions ar far more likely than men to commit to policies that benefit people who aren't men. The government position with the most influence? The Presidency. It is the quickest way to create a system that is fair, balanced and just for everyone. The second half of the book outlines specific action items (checklists of tasks) we can all do as part of this effort. Vote Her In focuses on us and what we can all do to more women into seats of power. It is organized around the inspirational messages seen on protest signs carried where it all began: the 2017 Women's March. Illustrations inspired by the signage can by found throughout the book. This book would make a great gift for anyone who is interested in politics, specifically women's politics. That of the politics of helping women attain better positions in society and having women and men co-exist in this society as better people. It is a wonderful book and I highly recommend reading it for this reason. 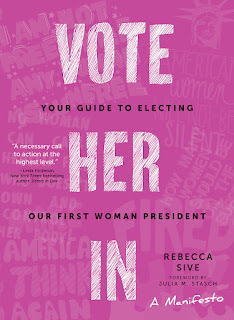 Vote Her In: Your Guide To Electing The First Woman President. A Manifesto retails for $19.95 and can be purchased online at www.agatepublishing.com, www.amazon.com and www.barnesandnoble.com. Follow Agate Publishing on Instagram: http://instagram.com/agatepublishing and Follow Agate Publishing on Twitter: @AgatePublishing.